On August 9th 2017, the international airport in Sihanoukville welcomed AirAsia’s maiden flight from Malaysia’s capital city. A water cannon salute greeted the opening route of AirAsia with a full flight of 180 passengers on board after the aircraft had landed at the airport. The new service operates on Monday, Wednesday, Friday and Sunday. 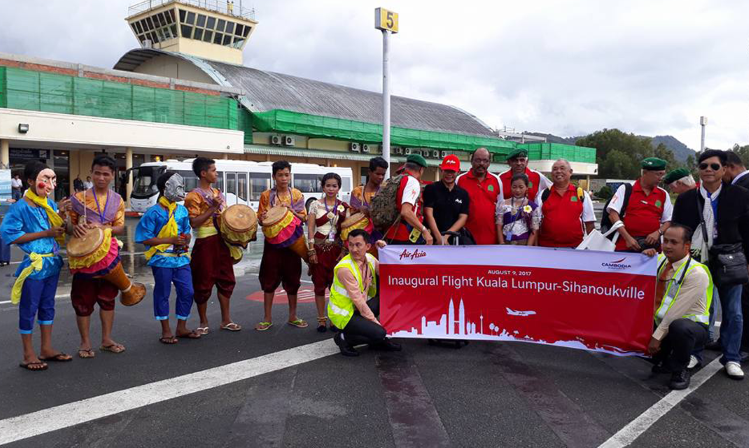 Coming after the launch in June 2016 of the first international scheduled flight between Ho Chi Minh City and Sihanoukville, this new connection to/from Kuala Lumpur via AirAsia reflects the airport’s boosting activities. In the 2nd quarter of 2017, the airport of Sihanoukville recorded spectacular growth of 269.4%, thanks to the opening of several new lines serving this destination, which is increasingly popular with domestic and Asian tourists.